A South Florida man was among three people killed when a helicopter crashed into a Southern California home, officials said Wednesday. Brian Reichelt, 56, was among three people on board the helicopter when it crashed in Newport Beach shortly after takeoff Tuesday. Also killed were 60-year-old Joseph Tena of Newport Beach, 45-year-old Kimberly Watzman of Santa Monica. Reichelt and Watzman both worked for The Standard Hotels, company officials confirmed. Reichelt worked for The Standard, Miami for six years as regional director of finance, while Watzman was general manager of The Standard, Hollywood. "We are heartbroken by the tragic loss of our friends," Amar Lalvani, CEO of Standard International, said in a statement. "Our focus now is on supporting their loved ones and our team during this difficult time." 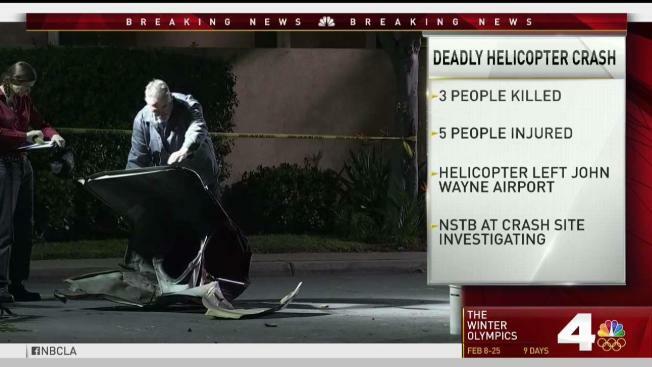 An investigator with the National Transportation Safety Board said the helicopter was headed to Catalina Island when it crashed. The investigator said there was no known distress call. The helicopter's pilot was among the three people on board who were killed. A fourth person on board was injured, as was a man on the ground.